How Many of Your Schoolâ€™s Graduates Occupy Top Corporate Posts? How Many of Your School’s Graduates Occupy Top Corporate Posts? Not everyone can be the company boss. By definition, there’s only one chief executive officer for each corporation. Though many college graduates who seek corporate employment dream of being the boss someday, most also accept that only a few in their batch will rise to become CEO or even a top executive. Using self-reported data from JobStreet.com users, we estimate that, on average, only about 2.2 percent of graduates of the country’s largest colleges and universities end up becoming CEO, senior vice president, vice president, assistant vice president and board member or director. The figure was derived from information provided by JobStreet.com users who came from 15 schools with the biggest number of graduates or alumni in the JobStreet.com database. However, five schools have a higher than average proportion of graduates among JobStreet.com users who described themselves as CEO and other top executive. 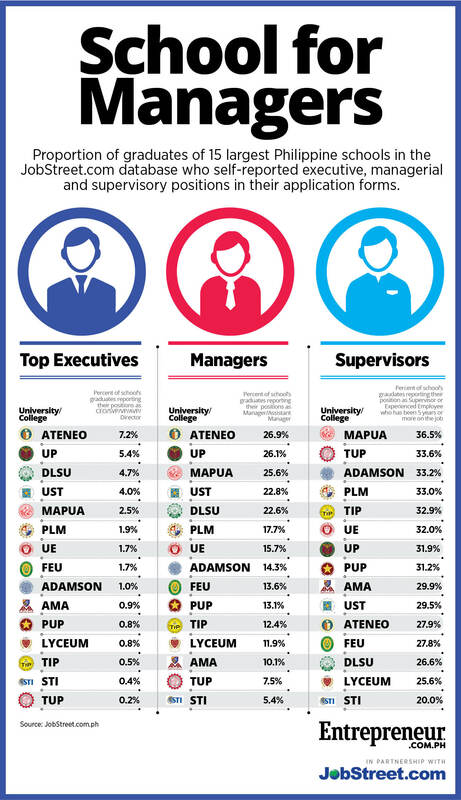 For example, around 7.2 percent of those who claim to be graduates of Ateneo de Manila University and other Ateneo schools said they occupy top executive posts. The same positions were reported by 5.2 percent of graduates of the various University of the Philippines (UP) campuses, 4.7 percent of graduates of various De La Salle University (DLSU) campuses, four percent of University of Santo Tomas (UST) graduates and 2.5 percent of the graduates of Mapua Institute of Technology. With little variation, the same pattern can be seen in the proportion of the various schools’ graduates who said they were managers or assistant managers. On average, only 16.4 percent of the 15 largest colleges and universities’ graduates among JobStreet.com users described their positions as such. Just six schools reported higher-than-average figures: Ateneo, UP, Mapua, UST, DLSU and the Pamantasan ng Lungsod ng Maynila (PLM). The pattern changes markedly, however, when looking at the proportion of the various schools’ graduates who described themselves as supervisors and employees who have been on the job for five or more years. The average figure is 30.1 percent but there are eight schools with higher-than-average percentages. These are Mapua, Technological University of the Philippines (TUP), Adamson University, PLM, Technological Institute of the Philippines (TIP), University of the East, UP and the Polytechnic University of the Philippines (PUP). The third list, which looks dominated by engineering schools, bears little resemblance with the first two. To be sure, school averages probably matter but are not decisive. Whether you become CEO or not ultimately doesn’t depend on the school you graduated from but on your capabilities, determination and track record. Home to Grab and Zalora, What Can Malaysia and Singapore Teach PH in Helping Startups?